Alfred began creating his own sculptures in 1958 and took part in his first private exhibition in 1959 at Alecco Saab’s Gallery in Beirut. He earned international recognition just a few years later, in 1961, when his works were featured in the International Exhibition of Sculpture at the Rodin Museum, Paris. This exhibition took place one year after Alfred received a scholarship from the French government to attend L’Ecole Nationale des Beaux Arts. Alfred created his own “austere, aesthetic world” of art “with the simplicity of peasants and the skill of builders,” comments Maroun Hakim on Alfred’s abstract and feminine style in An Nahar, January 2006. In an article in Al Mustaqbal, January 2006, editor and poet Paul Shaoul focuses neither on the specific forms in Alfred’s works nor on his use of woman, but rather on the transience in his work. “Alfred is a sculptor of passage; he goes from obsession to obsession, from illusion to illusion, from adventure to adventure, from beautiful madness to beautiful madness, from birth to birth,” Shaoul asserts. Though many, like Sultan, see clear influences on Alfred and his works, Shaoul believes that Alfred was a free spirit who did not follow any pre-existing theories or ideologies. Alfred’s modernist style and his pure passion of molding stone into art earned him much recognition in Lebanon and abroad. In addition to the fame he earned for himself through the annual Rachana International Sculpture Forum, Alfred also received an award from L’Orient newspaper in Lebanon in 1963, the Alexandria Biennial in 1974, and upon his death, Nassif Qalosh, the governor of northern Lebanon, awarded Alfred Lebanon’s Order of Merit. Alfred Basbous’ works continue to be displayed in exhibitions around the world and, of course, stand as a lasting tribute in Rachana. Alfred died at the age of 82 on January 1, 2006, after a long battle with cancer. Al Jadid, Vol. 11, no. 52 (Summer 2005); Copyright (c) 2005 by Al Jadid. Alfred Basbous, the second of three brothers who were gifted sculptors, was born at Rachana, Lebanon in 1924. He worked with stones since his childhood and he learned the basics of sculpture from his elder brother Michel. He started sculpture works in 1958. He works with stones, wood and metal. In 1960 he received a scholarship from the French Government in Paris and became Collamarini's student at "L'Ecole Nationale des Beaux-Arts". 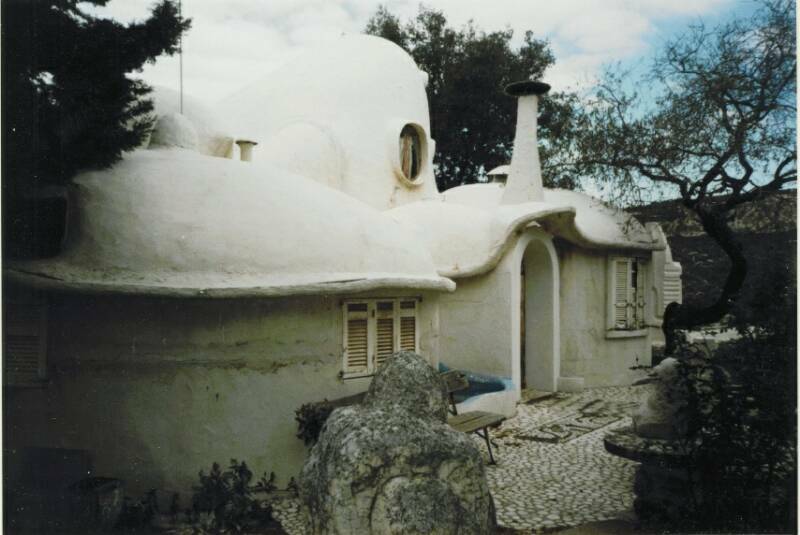 In 1994, Alfred Basbous organized the first International Forum of Sculpture at Rachana. Since then, The Forum has become an annual international Art event. 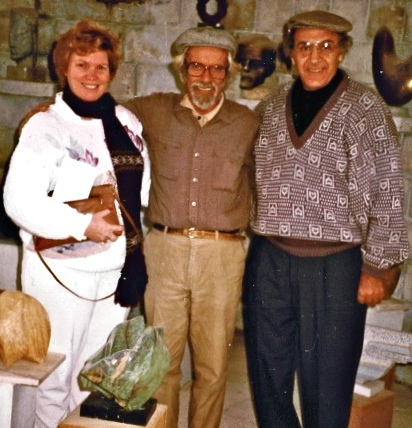 Peter and Mary Esseff with Alfred during their visit to the Basbous home in Rachana in 1989. 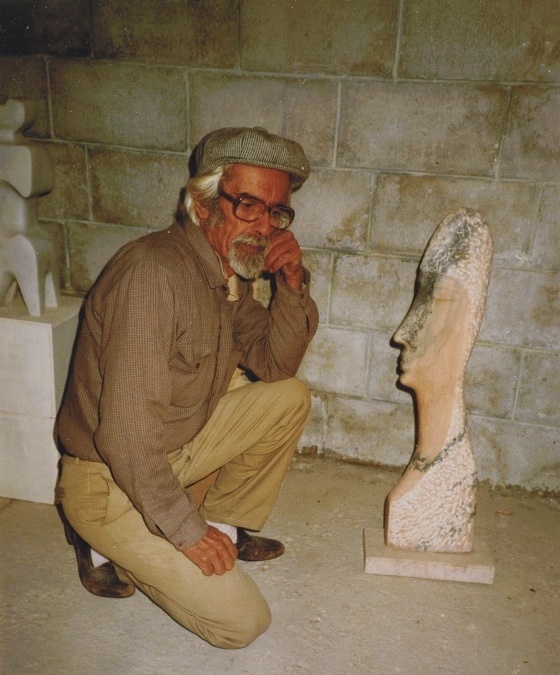 Alfred Basbous kneeling beside his marble sculpture "Contentment" which the Esseffs bought during their visit to Alfred's workshop in Rachana, 1989. Alfred Basbous' studio where he created the beautiful marble sculptures the Esseffs pirchased during their trip to the Basbous village in Rachana, Lebanon, 1989.